Especially when it is also long distance. Here at Rhino Moving, LLC we strive to make any long distance project as easy and efficient as possible. With every customer it is our goal to provide a unique and personalized moving experience because no two projects are ever the same. Relocating from San Diego to the Los Angeles area has become a bit of a routine for us at Rhino Moving, LLC. So for us it’s just a matter of accommodating your personal preferences to fit your moving experience. Since Los Angeles is under 200 miles we can still go with our hourly rates to try and cut costs. So instead of doing a flat rate price where we have to account for every little cost, we can brush certain charges “under the rug” to just be covered in the hourly rate. For instance, with our hourly rates, you will only be charged for the time used to complete the project. With a flat/ fixed rate price we have to account for the worst case scenario, meaning every possible outcome including traffic, long carry, gas, mileage, materials, back travel and anything else that can effect the moving process. When moving with our hourly rates there is a one time small gas fee and what is called California Double Drive time. The double drive time means that whatever time it takes to travel from your old address to your new address is doubled. Meaning if it takes the team 2 hours to drive up there, we add an additional 2 hours to the bill. So if the whole project took 6 hours, 2 of which was driving, we would charge for 8 hours. The double drive time covers all costs for mileage and time going to and from the project. Meaning the clock starts at your old residence and ends when the final piece is off the truck and placed where you want at your new place. Also, with our hourly rates, if there are any last minute changes we can easily accept. Let’s say we get to your new home in LA and a few pieces don’t quite fit they way you hoped. We can take them to donation/ dump or to a storage facility of your choice. With our flat rate, there is no room for last minute changes. It would be considered a breach of contract. Then you have to hire another company for a minimum amount of hours just to take care of what should have been an easy fix. This is because our team has to wrap/ protect everything with our moving blankets and also shrink wrap. This is to ensure that after being loaded into the truck there is no chance of damage from shifting during transportation. Our teams are all trained to treat every project and every item as if it is their own from start to finish. Once the team has successfully loaded the truck and anchored everything down they will begin the drive up to the Los Angeles area. Here in the office, we keep tabs on traffic for the main routes for our teams. That way when they leave the loading point we can make them aware of any traffic or obstructions in their route. Given we can’t foresee everything, we try our very best to make sure we find the most optimal route possible for each project. We do have to stop at the scales, like all larger trucks, but since we make the route so often we rarely have any issues past the long lines. 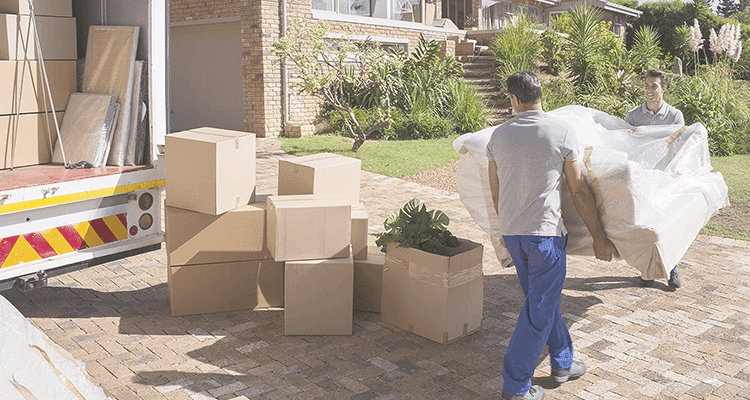 Once the team has arrived at your new address, that is when the drive time ends and the team can either start unloading or take a small break off the clock before starting again. Now, the process of unloading the truck begins. We are a long distance movers full-service company so as the items come off the truck you may just direct the movers to where you would like all of your furniture. They will also reassemble any and all beds, cribs, vanities and any other items that may have needed to be disassembled during the load. The movers will also take each box to their respective areas that they were packed from and keep them organized so you still have room to move around and unpack everything. The unloading process is usually much easier then the loading but this is all circumstantial. It all depends on accessibility for the movers via parking, carry distance from truck to door and of course stairs or elevators. As the team takes the blankets and protective materials off of the furniture it is required to also fold and put the materials back the way they were upon arrival. The truck arrives cleaned and organized so the truck must also leave that way. Once everything is off the truck and the labor is completed, meaning you are satisfied where everything is in your home and you confirm you are satisfied with the labor, the clock will end. That is when the team will contact us at the main office and finalize the bill to present to you the final costs. Once the team has collected payment they will grab all their left over belongings and depart from the project. You are now officially moved into your new home and can begin the process of nesting! Congratulations on a flawless, stress free relocation with the #1 personal long distance movers in California!